You've probably seen Leonardo Da Vinci's "The Last Supper" painting, but we're pretty sure you've never seen it like this before. In the hands of West Hollywood-based artist and graphic designer Bronwyn Lundberg, the iconic work became a love letter to famous lesbian figures like Ellen DeGeneres (as Jesus) and Portia de Rossi (as Mary Magdalene), as well as Wanda Sykes, Rosie O'Donnell and others. We caught up with Lundberg to find out how the piece, which has been making the rounds on the blogosphere in recent days and is available for purchase on her Etsy page, came about, how she chose which lesbians to include and more. The Huffington Post: Where did the inspiration for the "Lesbian Last Supper" come from? Bronwyn Lundberg: Honestly, the inspiration behind the "Lesbian Last Supper" came from a conversation I was having with a friend. She was getting a new bed delivered that day and I jokingly suggested she install a ridiculous headboard. "Like 'The Last Supper,' something really intense and unusual." I'm not sure why that came to mind first, but the next thing I knew she asked me to draw my own interpretation of the painting. I went home, discussed it with my girlfriend, and she was the genius that suggested I choose Lesbians as the theme. Instantly we thought of Ellen as Jesus, and the rest followed suit pretty quickly. How did you decide which lesbians to include? I chose Ellen as Jesus because of the incredibly positive impact she's had on the masses. When she came out as gay on television her career took an unjust beating, and she rose form the ashes to become more powerful and well-liked than ever. Portia de Rossi was the easy choice as Mary Magdalene. The only other character I wanted to match up historically was Judas. Despite her status as a fictional character, I absolutely had to choose Shane McCutcheon from "The L Word" as Judas because of her notoriously bad behavior in relationships. The rest of the women I chose because they influenced my life in a personal way. I wouldn't be the comfortably gay woman I am today without their courage to come out. Have you experienced any backlash to the work? Everyone I've shown in person has been really enthusiastic. Then again, I live in West Hollywood where some crosswalks are literally paved as rainbows! I sensibly made the decision not to read comments about the piece online. I'm sure there are folks who aren't happy with it, but what can you do? Art isn't about pleasing everyone. I drew it because it made me smile and because I wanted to pay tribute to the women who made it easier to be myself. What do you say to those who claim the piece is offensive/sacrilegious? Religious art will inevitably strike strong responses in some people, but those are issues I can't worry about because I really can't identify with them. I won't apologize for making something I think the world needed to see. How do you feel about being termed a "lesbian artist"? I'm certainly a lesbian and I definitely consider myself an artist. There are also 100 other labels that help define who I am. 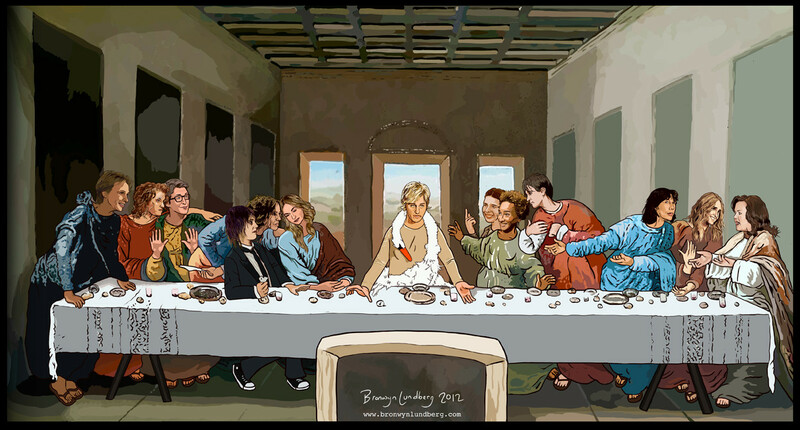 For more info on Lundberg, visit her official website and her Etsy site where you can purchase your own copy of the lesbian "The Last Supper." At the age of 26, <a href="http://baltrop.org/" target="_hplink">Alvin Baltrop </a> began photographing Manhattan's West Side piers, an area of refuge for queer teenage runaways as well as a stage for the city's underground gay scene. The stark reality conveyed in Baltrop's photographs was not well received by the mainstream art world, and so his work was largely ignored until after his death. But the thousands of images captured by Baltrop between 1975 and 1986 stand as remnants of a New York City community rarely captured before or after. IMAGE: Alvin Baltrop, Navy Sailors, 1969--72, Gelatin-silver print (2011), 8.5 x 12.75 inches. Courtesy of The Alvin Baltrop Trust and Third Streaming (NY).